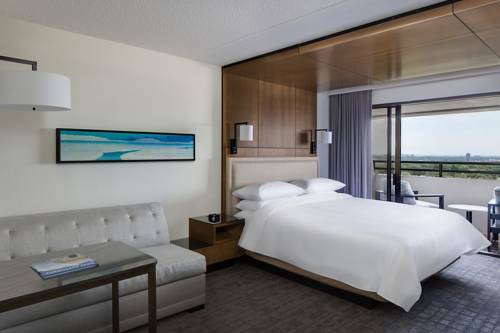 Newly renovated hotel with a free shuttle service to the nearby San Antonio International Airport (SAT) and free hotel parking, there is no better choice than the San Antonio Marriott Northwest for your stay in San Antonio, TX. Our high-class guest rooms include plush pillow-top mattresses, pull-out sofa bed, HDTV with premium channels, elegant bathrooms, and high-speed WiFi. Relax after a long day in our outdoor pool complete with sundeck or take advantage of our fitness center. Planning a big event? Make your meeting, wedding or Quinceanera an unforgettable experience in one of our 9 event venues with space for up to 675 guests! Enjoy a meal and cocktail at our hotel restaurant and lounge or dine privately with our superb room service. Our hotel near San Antonio Airport is just 15 minutes from the San Antonio Zoo, University of Texas San Antonio, and Six Flags Fiesta Texas. Other nearby attractions include The Alamo, San Antonio River Walk, San Antonio College, Sea World and of course downtown San Antonio. Experience elevated casual dining at its finest. Our expertly prepared menu is a blend of traditional favorites and unique twists on classic dishes. We also offer a selection of world-renowned wines, craft beer, and inspired cocktails. - San Antonio "Walking Tours"
~5 miles from San Antonio.